Denmark Hill Campus provides facilities for the Faculty of Life Sciences & Medicine, the Dental Institute, and is the home of the Institute of Psychiatry, Psychology and Neuroscience and the Champion Hill Residence. Denmark Hill is situated in Camberwell, in the London Borough of Southwark. In the last few years this and the neighbouring areas have undergone an incredible process of regeneration and are now one of the most exciting places in London to live, study and work. Further information about the area is available on the Institute of Psychiatry, Psychology & Neuroscience webpages. Prospective students may arrange to visit and tour the campus. A virtual tour of the campus is available to allow you to explore the campus and buildings. Denmark Hill Station, adjacent to the Campus, serves trains from Victoria, London Bridge, Blackfriars and Elephant and Castle. Loughborough Junction is about 15 minutes walk away and is served by Thameslink trains from London Blackfriars via Elephant and Castle. The nearest tube stations are Oval (Northern Line) and Elephant and Castle (Northern and Bakerloo Lines) from where the journey has to be completed by bus. 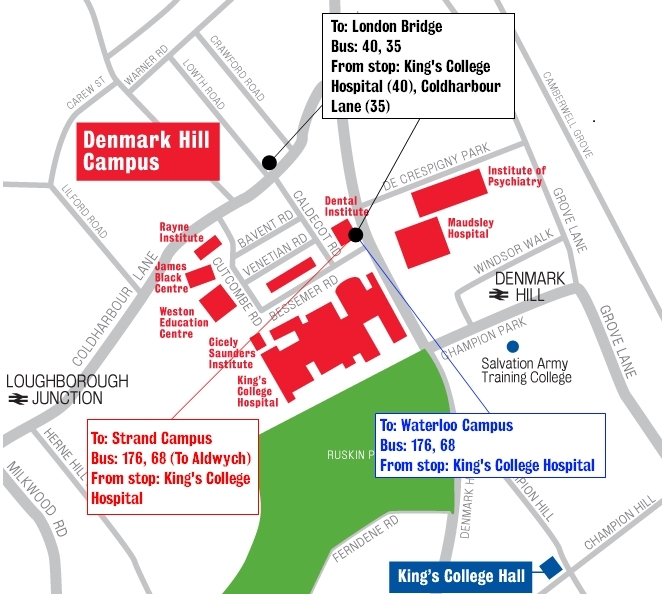 King's College Hospital, Denmark Hill: 40, 68, 176, 185, 468, 484. Camberwell Green (about 10 minutes walk): 12, 35, 36, 42, 45, 345, 171. Coldharbour Lane (about five minutes walk): 35, 45, 345. There is no car parking for the actual campus. A public car park is located on Bessemer Road (part of the hospital complex) at a cost of £2.50 per hour. Secure bicycle racks are available for staff and student use and are located close to the Weston Education Centre. To use this facility you must register your interest in person with Campus Operations and show your ID card to security in order to gain access to the area. There is a waiting list for the limited number of parking spaces available to staff only. There is a small provision of visitors’ parking spaces available on a first come, first served basis. However, if you inform reception with the full details of your vehicle we will try to ensure a space is reserved for you. There are limited spaces reserved for staff, students and visitors to the right of the Institute’s Main Building for a Pick Up & Drop Off Area. This facility is for people who need parking for up to 90 minutes, Please remember to visit Main Reception for a Temporary Parking Permit and display this on your dashboard. There is bicycle parking underneath the David Goldberg Building and outside the SGDP Building for students and staff. The area is monitored by security services, and students and staff must register with security to use these spaces. To Guy's Campus Number 40 to Borough High Road, then continue on foot or 35 from outside the Rayne Institute or Camberwell Green. To London Bridge Station from Denmark Hill. To Strand Campus 68 or 176 from outside the Dental Institute on Denmark Hill or 171 from Camberwell Green. Thameslink to Elephant and Castle, then bus number 176, 68, 171 or 1. To Waterloo Campus 68 or 176 from outside the Dental Institute on Denmark Hill or 171 from Camberwell Green Thameslink to Elephant and Castle, then bus number 176, 68, 171 or 1 to Waterloo Station, or Bakerloo line tube to Waterloo underground. To St Thomas' Campus 12 or 148 from Camberwell Green Thameslink to Elephant and Castle, then either bus 12, 53 or 148. A comprehensive introduction to the fundamentals of modern health-focused informatics research.